Ytterbium oxide was first isolated by Swiss chemist Jean Charles Galissard de Marignac from a sample of gadolinite in 1878. Marignac suspected the compound contained a previously unknown element, and named this element “ytterbium” due to the origins of the first gadolinite samples in a mine near Ytterby, Sweden. Ytterbium was the last of four elements to be given a name derived from association with the Ytterby mine, the others being yttrium, terbium, and erbium. Ytterbium is used most often as a dopant. In crystal and glass structures, ytterbium doping produces laser media and optical fibers. In stainless steel, ytterbium improves grain refinement and strength. Ytterbium may be added to silicon photocells to improve efficiency of solar energy absorption at infrared wavelengths. Ytterbium is also used in thermal barrier coatings on transition metal alloy substrates. Ytterbium metal has the unique property of increasing in electrical resistance when under stress; this property is exploited in stress gauges for monitoring ground deformations from earthquakes and nuclear explosions. It has also been used to produce an atomic clock with greater accuracy than the cesium atomic clock used as the current time standard. 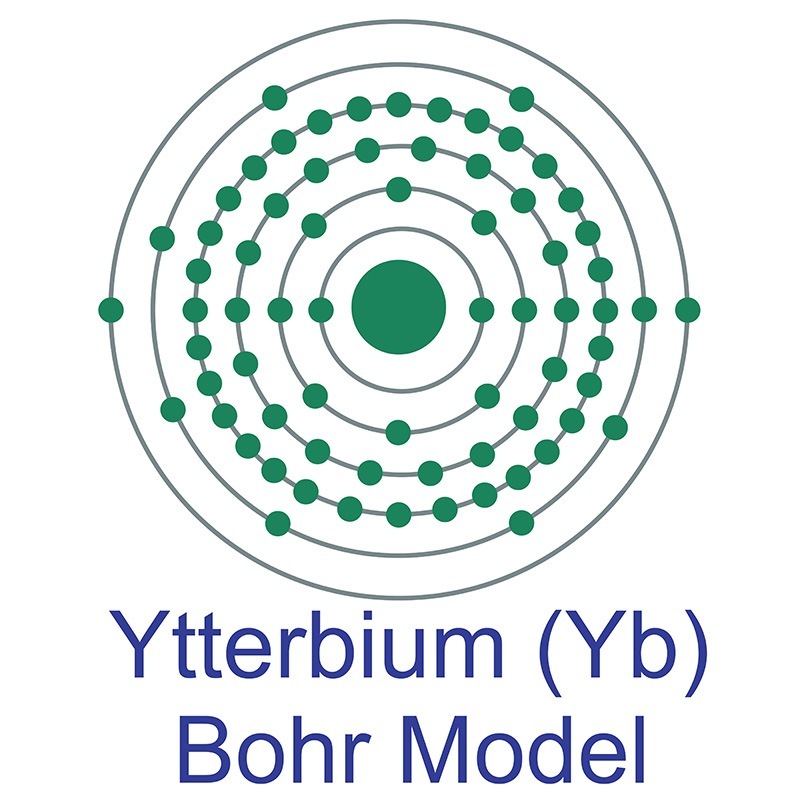 Experimentally, ytterbium is being investigated for a variety of specialized applications, including in highly sensitive small-molecule sensors and medical X-ray computed tomography scan contrast agents. Ytterbium is a rare earth element and can theoretically be found in any rare earth-containing mineral, but as a heavy rare earth element (HREE) it is more common in HREE-enriched minerals such as xenotime and euxenite. Additionally, ytterbium is present in ion adsorption clays, which are a major source of HREEs due to their relative ease of processing, despite the low percentage quantities of rare earths they contain. Ytterbium is being applied to numerous fiber amplifier and fiber optic technologies and in various lasing applications. It has a single dominant absorption band at 985 in the infra-red making it useful in silicon photocells to directly convert radiant energy to electricity. Ytterbium metal increases its electrical resistance when subjected to very high stresses. This property is used in stress gauges for monitoring ground deformations from earthquakes and nuclear explosions. It is also used in thermal barrier system bond coatings on nickel, iron and other transitional metal alloy substrates. Ytterbium is available as metal and compounds with purities from 99% to 99.999% (ACS grade to ultra-high purity). Elemental or metallic forms of ytterbium include pellets, rod, wire, and granules for evaporation source material purposes. Ytterbium oxides are available in powder and dense pellet form for such uses as optical coating and thin film applications. Oxides tend to be insoluble. Fluorides are another insoluble form for uses in which oxygen is undesirable such as metallurgy, chemical and physical vapor deposition and in some optical coatings. Ytterbium is also available in soluble forms including chloride, nitrate and acetate. These compounds can be manufactured as solutions at specified stoichiometries. Ytterbium has 2 valency states, +2 and +3. The number of electrons in each of Ytterbium's shells is 2, 8, 18, 32, 8, 2 and its electron configuration is [Xe]4f14 6s2. In its elemental form, CAS 7440-64-4. ytterbium has a silvery-white color.The Ytterbium atom has a radius of 194 pm and its Van der Waals radius is unknown. On the periodic table, Ytterbium is a Block F, Group 3, Period 6 element. Ytterbium is found in monazite sand as well as the ores euxenite and xenotime. Ytterbium was first discovered by Jean de Marignac in 1878. The name Ytterbium originates after the name for the Swedish village of Ytterby. Ytterbium is considered to be fairly toxic. Safety data for Ytterbium and its compounds can vary widely depending on the form. For potential hazard information, toxicity, and road, sea and air transportation limitations, such as DOT Hazard Class, DOT Number, EU Number, NFPA Health rating and RTECS Class, please see the specific material or compound referenced in the Products tab. The below information applies to elemental (metallic) Ytterbium. Naturally occurring ytterbium has 7 stable isotopes: 168Yb, 170Yb, 171Yb, 172Yb, 173Yb, 174Yb, and 176Yb.